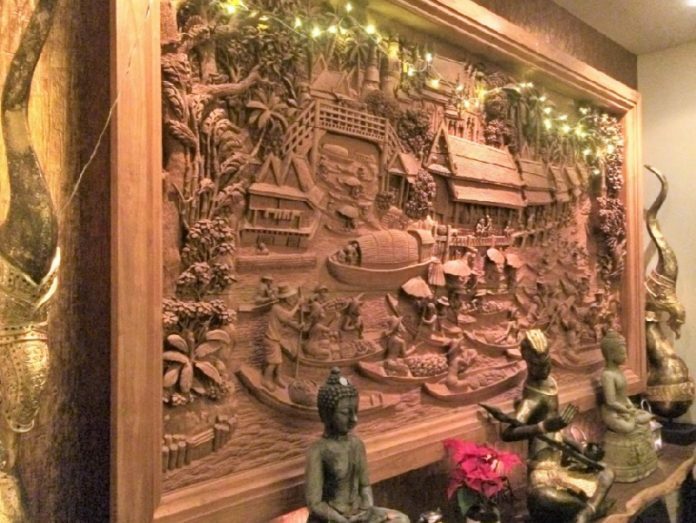 Sukhothai is an authentic Thai style restaurant on Cheltenham Parade in Harrogate. 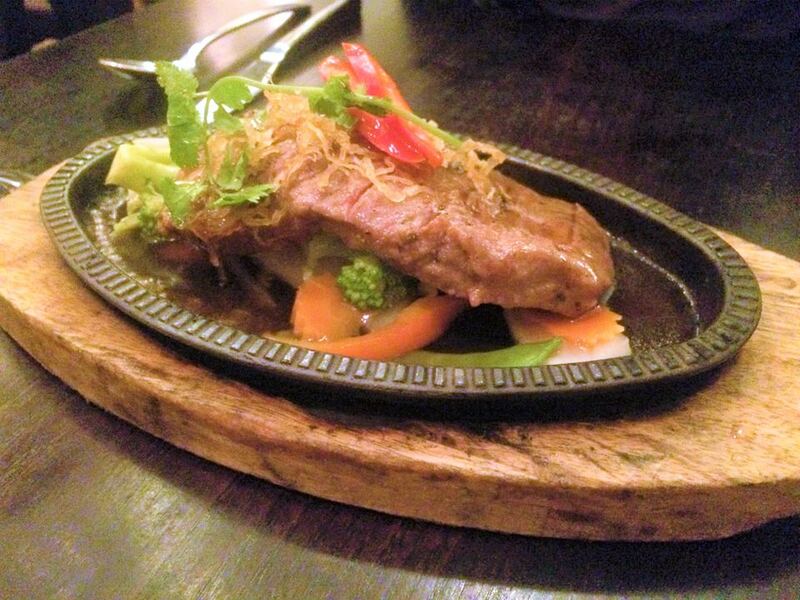 The lovely people at Sukhothai reached out to me and asked if I can review their restaurant. As I’ve said before I’m no critic but like you, I believe in good food and, sometimes more importantly, good service makes all the difference to eating out and a memorable experience. How did Sukhothai get it’s name? The answer lies just over 240 miles north of Bangkok and is the old capital of Thailand. Sukhothai is the birthplace of Sukhothai’s owner and translates into English as “The Dawn of Happiness”. Who’s behind this superb restaurant? After running a successful restaurant in Bangkok for eight years, head chef and owner Ban Kaewkraikhot relocated to the UK to run various well known Yorkshire restaurants. In 2002 she decided to go it alone and opened her first restaurant in the heart of Chapel Allerton. 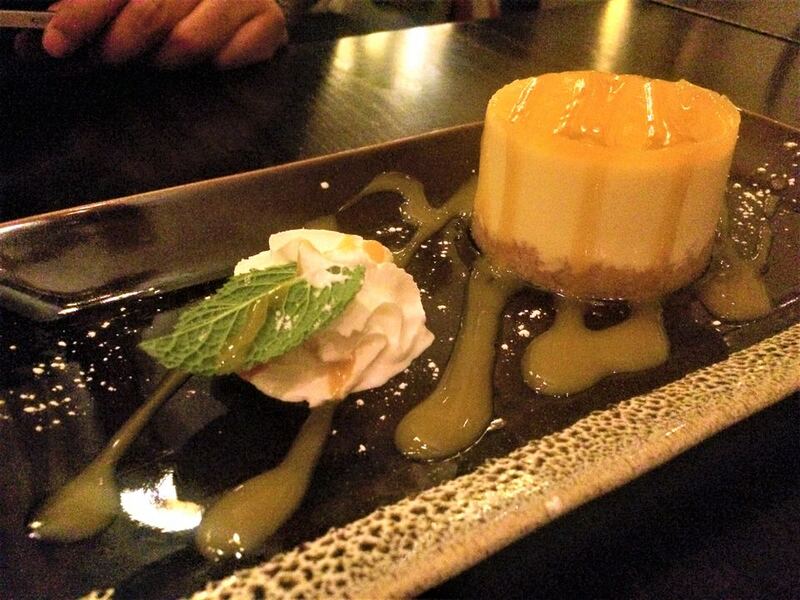 She believes the success of Sukhothai is it’s super-attentive service and imaginative yet authentic menu. 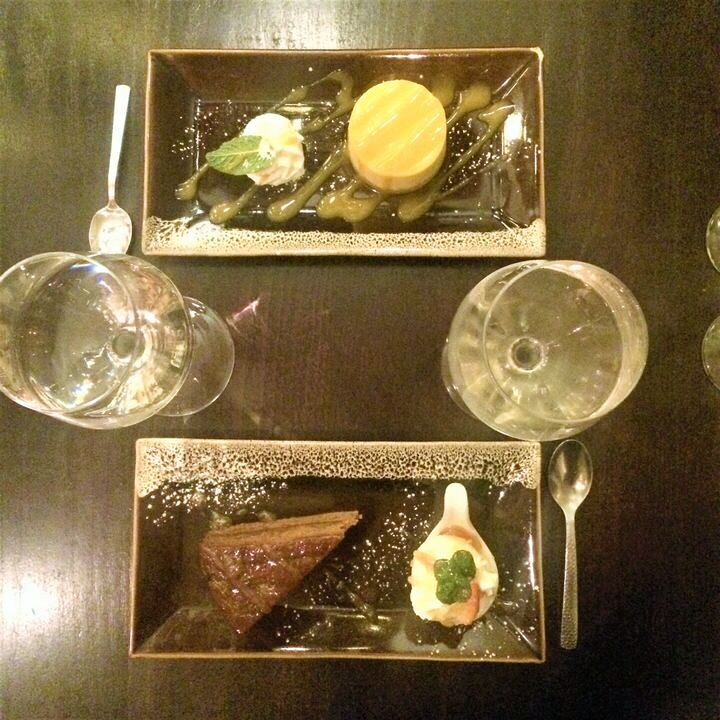 The restaurant is pretty much in the town centre of Harrogate, just a short stroll down the hill from Halifax Bank. Niki and I were greeted by the restaurant manager, Manny (pictured right) who looked after us for the whole evening. 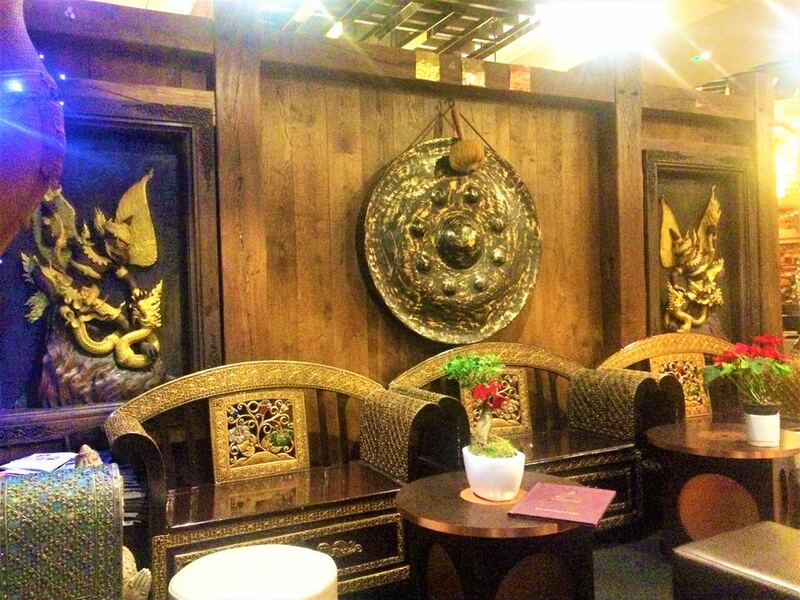 Upon seating we viewed the stunning authentic Thai interior. On the wall behind me was a beautiful wood carving of a traditional fishing village, we studied it with intrigue. We also noticed that many of the statues around the restaurant had coins balanced upon them so we decided to pop a coin on and make a wish – I can’t tell you otherwise it won’t come true! 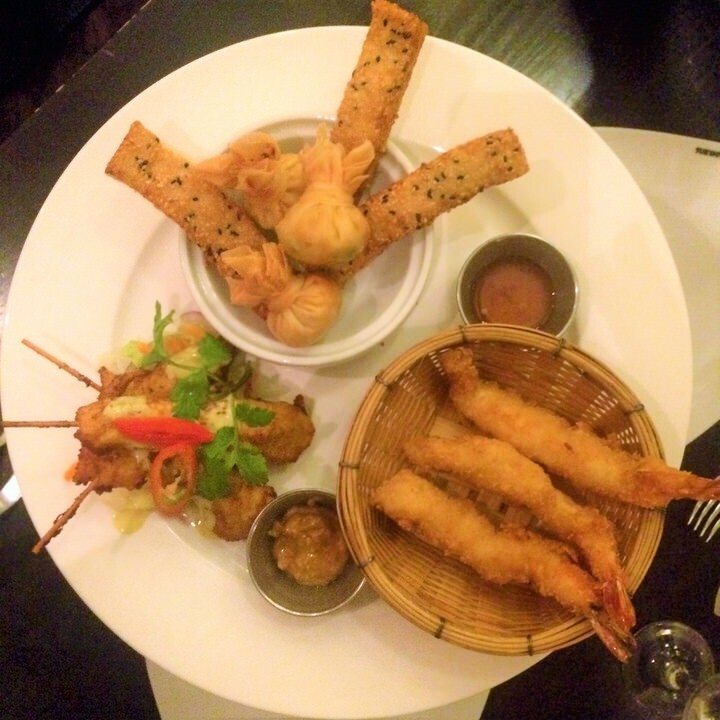 After perusing the extensive menu – there’s something for everyone – we decided to ask Manny for his recommendations. Along with you guys, Manny’s top suggestions was the Weeping Tiger and the Thai Green Curry. Along with a special mix starter to share. Deal done. Manny also suggested a Sauvgnon Blanc wine called The Fathoms with the meal and it was perfect. A crisp white wine with a hint of apple and gooseberry… delicious! They weren’t wrong. The service was fantastic. So attentive and warm. Owner Ban certainly lives up to her ethos of having good service. 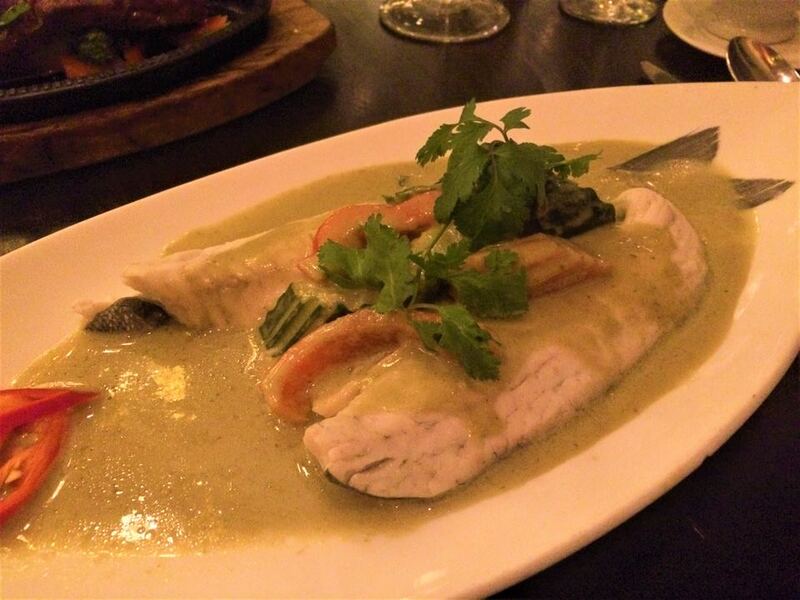 For main I had a beautiful Pla Gang Kiew Wan (£14.95); which was a whole steamed sea bass in Thai green curry with coconut milk, bamboo shoots and courgette. 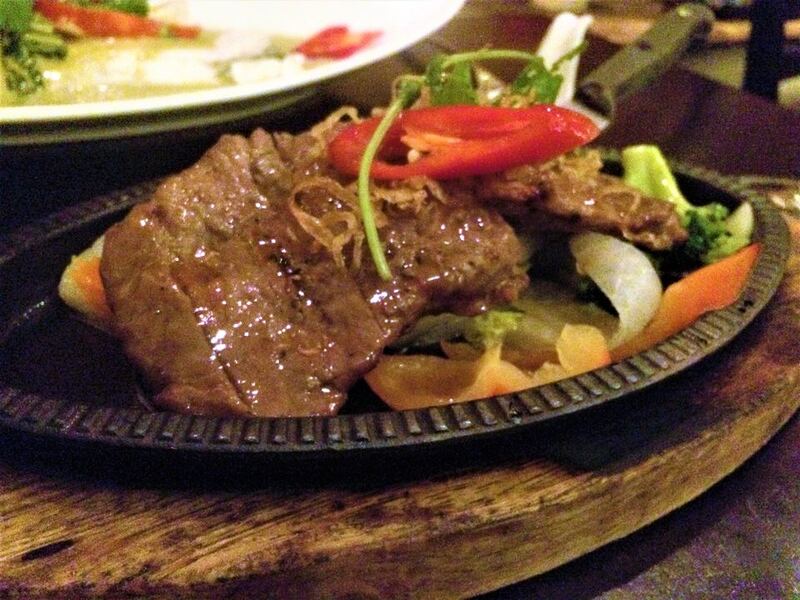 Niki went for a popular suggestion of the Weeping Tiger (£15.95); a sirloin steak, grilled Thai-style and served on a sizzling hot platter with special sauce. Both were great dishes however I felt Niki’s steak was a little over cooked for my liking but that’s personal preference. 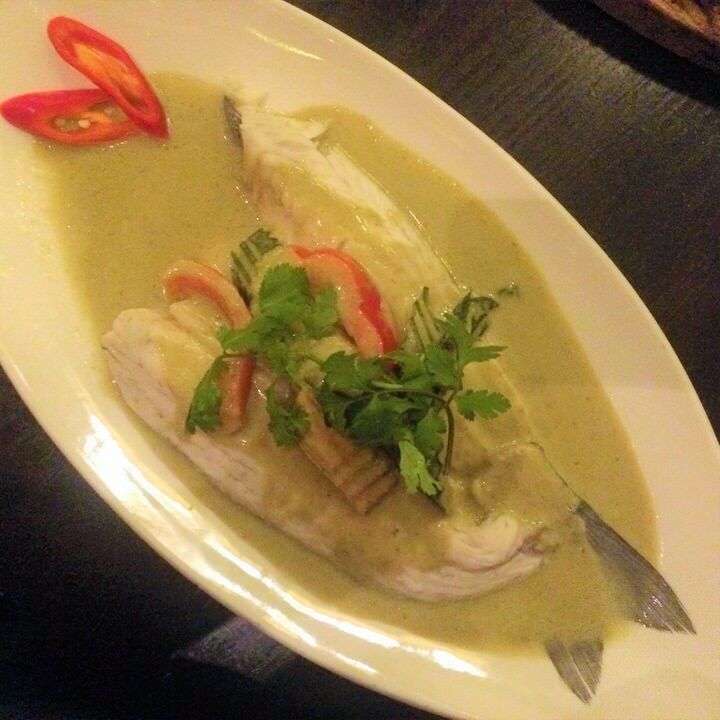 The sea bas was beautifully light and the Thai green sauce was creamy and delicious – not too hot but hot enough! For dessert I fancied something a little homely so opted for their Pear and Ginger Cake with Ice Cream (£4.95). 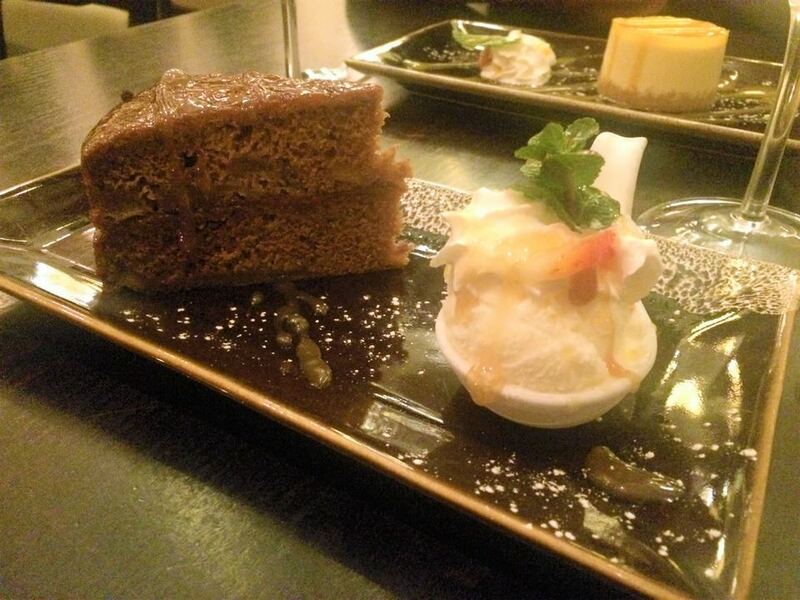 A light and fluffy cake with a warming spice too it, a perfect pud to end the night. Niki chose a Mango Cheese Cake with a sweet biscuit base (£4.95). Niki enjoyed the cheese cake but I felt the base was a little sweet and soft for my liking. The night was perfect, food was excellent but the stand out for me was the service. I will be heading back to Sukhothai very soon weather it be in Harrogate or their Leeds restaurants. P.S. 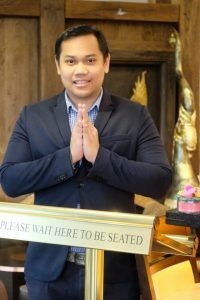 Thank you to Sukhothai for inviting me to review their restaurant. A special thanks to Manny for recommending superb food and great wine! My views are my own. 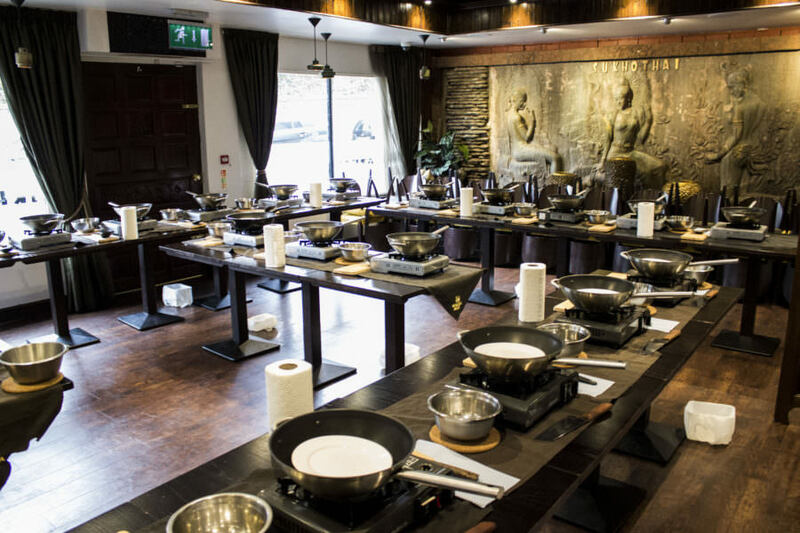 Fabulous place- definately check out Chapel Allerton Sukothai its got such a different vibe to Harrogate, small, tables tight together but brilliant atmosphere it was our local when we lived there.